La Carlota City-based blogger and Negros Daily Bulletin columnist Gil Camporazo won two of the seven awards adjudged by the Philippine Blog Awards, Inc. - Visayas (PBA-Visayas), in an event held in Silay City last Saturday. 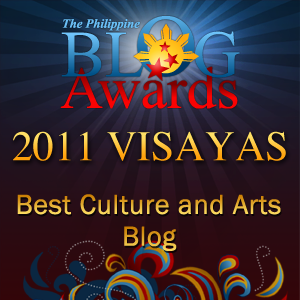 Camporazo's Blog won under two categories - his "Tumandok" under culture and arts and "Random Thoughts" under lifestyle category. Winners under five other categories are "Flavours of Iloilo" under food and beverage blog category; "The Young Pinoy Blogger" under the personal blog category; "onethirdpoundpatty" under the photo blog category; Technology - Leon Kilat: The CybercafeExperiments under the technology blog; and Blackpack Traveler under travel blog category. The 2011 PBA - Visayas is hosted by the Negros Bloggers and Silay City was chosen as venue which June Sonido, President of PBA, Inc. described with awe. The awarding ceremony held at Senator Jose C. Lacson Civic and Cultural Center was attended no less by Mayor Jose "Oti" Montelibano as head of the host Silay Local Government Unit (Silay LGU) popularly called "Silay Civic Center" which is "the first cultural center of the Philippines" far ahead of the Manila-based Cultural Center of the Philippines. Congratulations!! !....your blog deserves to win...It's good to have an award giving body like this. Wow! Conratulations, Sir. I also have visited your Tumandok blog and read some pages on it. They're good. Godspeed! Wow Congrats Sir! 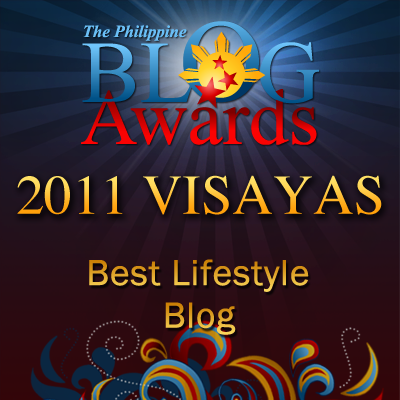 Ive been wanting to go to the Visayas Blog Awards.. But Schedule didn't permit. congrats! may you continue to bring informative and insightful posts! Congratulations! that was indeed a great achievement! Congrartulations to your achievements .Hopefully my blog will join some awards too.I'm glad to have you as one of the member of FBW. wow! congrats! =) i've been reading flavours of iloilo too. Congrats! You deserve it. I know how you put much effort on your posts. :) Keep it up! Congratulations! this is an honor! Keep up the good work! Congratulations. It will be great to sit down with a cup of coffee and go over your work. @lexxuz nice to hear from you. You're right with this accolade for the first time I've received not only one recognition but two, I'm more than inspired to do more, to blog more. My talent has been recognized by PBA, the prestigious award-giving body. Congratulations for the well deserved award! More awards to come your way, sir! Aww I don't know him, but congrats to him who won two awards! Galing! I was supposed to be ther on the said awarding, it it happened i was invited by sir enrico. However, conflict sa sked ng work ko d2...anywys congrats Sir! galing naman... 2 awards ang nakuha po ninyo... hope you can give us tips on how to achieve it... congrats... Yahweh bless. woooow! There's a blog awards in the Philippines? Congratulations guys! That's totally cool! @Ralph take note its the quality and usability that count. 80 per cent quality of the write-up and 20 per cent of the usability of the blog. That's there criteria for judging. When you want to join any contest, you should know first the criteria or requirements for judging. And stick to them. That's the secret of winning. Gets?